You are here: Home / Lifestyle / How Do You Do Your Dishes? As for hand washing dishes, I refuse to have a dish drainer sit on my counter top full time, so we use absorbent pads as a temporary drainer. I let the dishes drip dry for a bit and then put them away and tuck the pad in a rack on the cabinet. Guilty as charged for putting things away on the wet side far too often! Recently I bought this beautiful new mat from Etsy from A Little Frayed. Yes $25 was a lot to spend on a dish mat, but this beautiful pattern has made the whole process so much happier. Plus this one is bigger than our Bed, Bath and Beyond ones so I can fit more dishes on one instead of breaking out our spare. Now on to the dishwasher. I have found my favorite technique is to empty everything out onto the counter before starting to put anything away. That gets all the bending done in one sweep and then I can let the blood return to my head while I put everything away. It also means the dishwasher is open tempting curious little hands for minimal time. The silverware seems to be the biggest pain to sort. You know how you always think you’ve gathered all the forks but then you find one hiding under your remaining pile? I love talking about little processes like this. Please share your dish pet peeves and secrets!! I always dread emptying the dishwasher but it’s never as bad as you contemplate it being! I have it down to four minutes flat! I had a double take when I saw the title of this post because I was JUST thinking about this topic as I was washing the dishes! I was even pondering writing a post about it! We usually hand wash our dishes on a regular day at our house. I’ve learned some techniques from my parents to make things more efficient. First, I rinse out one of the relatively clean bowls that’s in the sink and fill it with lots of soap and warm water. I keep dipping the sponge in this bowl as I wash the rest of the dishes. I also often run the sponge under the hot tap to rinse out any gross things. Once all the dishes are sudsy, I use hot water to rinse them all. 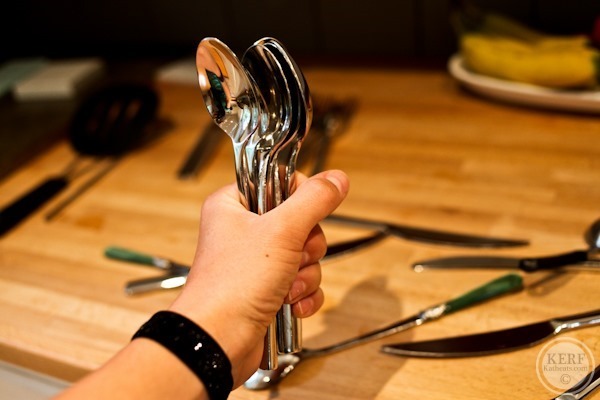 Utensils are rinsed all at once at the end because it’s easy to just hold them together under the faucet. Then I let them dry on the drying rack, and we usually empty the rack before washing the next batch of dishes! I use this collapsible rack http://www.bedbathandbeyond.com/store/product/bamboo-folding-dish-rack/1013389144?device=c&network=g&matchtype=&mcid=PS_googlepla_nonbrand_kitchenaccessories_&gclid=CPau57GN0bsCFdBlOgod01IAPA (which I found really pleasing to the eye!). We have major shortage of counter space, so I just store it on a hook with other pots and pans. and I can’t even talk about unloading the dishwasher. it’s just the worst no matter how you cut it. I have the same collapsible rack and love it! The dishes can drain and dry and then just collapse the rack and store it away. 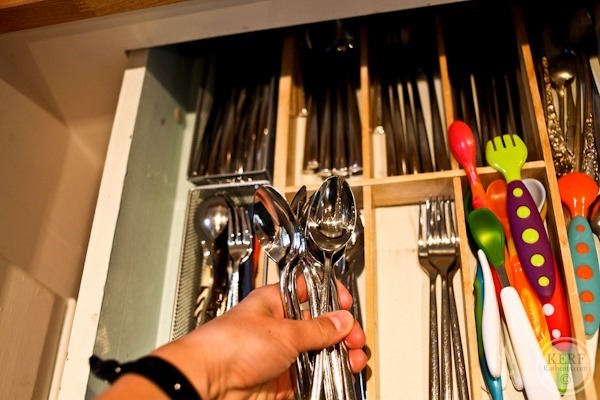 When I sort my flatware after it has dried, I just grab a huge handful, open the drawer and toss them into their specific spots. We have a dishwasher in our apartment but it’s a little crooked and the detergent dispenser won’t open so I choose to wash dishes by hand. I usually just get my sponge really soapy and hot and scrub and wash each item at a time. I keep the hot water running low and turn it on more to rinse. This might use a bit more water but I think it’s cleaner. Sometimes if I just have items that aren’t very dirty, I’ll fill one side of the sink with hot water and soap and scrub all the dishes, set aside to the dry side of the sink then rinse them out in hot running water afterwards. I use a plastic colander to rinse the silverware. I just let dishes dry in the dishwasher with it open. I keep enough space between dishes for the air to dry them. Our kitchen is small so I just unload the dishwasher a few items at a time. ; stacking bowls and plates. I just had to tackle a portion the of holiday dishes. Still got more to do after the first load dries! I take the whole silverware basket over to the drawer and put it straight in. One less step than yours! I love emptying out the dishwasher! I find it so relaxing and now everyone knows that if they start to empty it for some strange reason I will start yelling at them, haha! We also use a dish mat for quick dish washing as well. It is so much nicer then a big ugly rack! I sort the utensils when I put them in the dishwasher basket. One each for forks, spoons, butter knives, baby utensils, and the other two for cooking/serving utensils. I do this too! I have no problem emptying the dishwasher… i hate making the bed! YES. This has been a huge game changer for me. Saves so much time. I do this too and it helps a lot! And it takes no additional time when you load, just a teeny bit of extra thought. Don’t you find that the spoons “spoon” together and any dirt trapped between them doesn’t get washed? I purposely only put one spoon in each section to avoid this problem! I take the whole basket to the cutlery drawer and inspect each item as I put it in. 99.9% of the time they’re perfectly clean, but nothing worse than finding a dirty spoon in your drawer after someone has failed to observe the “one spoon in each section” rule! We separate everything out when we are putting our silverware into our dishwasher’s silverware rack. We use the first (slotted) section for knives, the second section for spoons, the third for forks, and the last for serving utensils. 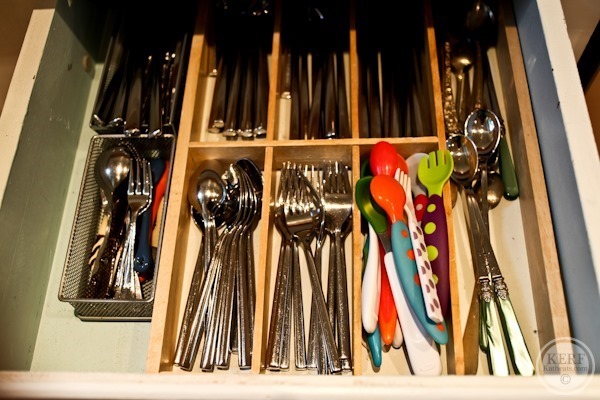 This way, after the dishwasher has been run, I just grab from each section and put the forks/spoons/knives/etc into the corresponding section of the utensil organizer in my kitchen drawer. I’d rather separate a few utensils after our meals than have the whole lot of them to separate once I’ve run the dishwasher…because I just hate emptying the dishwasher so much!! I always group like dishes in the dishwasher so that unloading is easy. When I do dirty dishes, I always load the duplicate dishes in groups (plates first, then glasses etc. ) I also try to refrain from using funky shaped pieces daily. They’re fun for taking pics, but don’t make for efficient dishwasher loading. We have two sinks – with the second one used to hold the dish drying rack. Given that I only have two square feet of counterspace, I am not about to give any of it up to a dish drying rack. And it keeps the water that drips off in the sink. Win-win. I have clean kitchen OCD. It has been noted I cannot sleep if I know a kitchen anywhere within my vicinity is dirty – most of our friends will confirm this. I will be the last person to leave a party because I’m in the kitchen cleaning up only to realize everyone else has left and once recently, the hostess had gone to bed. (A trick I’ve pulled myself.) I clean the kitchen all day long. I can’t stand a dirty dish in the sink, so everything immediately goes into the dishwasher after being used, unless it is something that must be handwashed (cutting boards, pots, pans, knives, anything wooden, my good serving dishes & spoons, china & crystal). Pat does the after dinner dishes – which generally are the dishes we ate off of and whatever pots are left. As I’m cooking, I tend to clean as I go – old restaurant habits combined with my OCD where I can’t stand to see a dish sitting in the sink. We only run the dishwasher when full – which can be as often as twice a day or as little as every other day. As for unloading the dishwasher, my friend Mollie is pretty sure if there were an Olympic category for dishwasher unloading, I’d win gold for sure. I can unload that puppy in less than two minutes flat, sorting as I go along, saving the silverware bin for last. I tend to start with the upper rack (glasses) first – they live in the cabinet just above the dishwasher, so that’s pretty easy. The lower rack are plates & bowls – I grab a few of the same size at a time, stacking as I go and then putting in the proper cabinet. I stand over the open silverware drawer, sorting as I go. 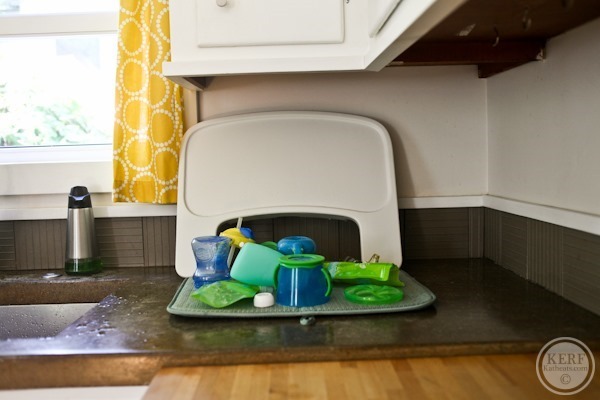 That way, any dirty dishes that accumulated while the dishwasher was running can be put in the dishwasher immediately. And with the drying rack down in my second sink, I can handwash dishes all day long, leaving them to dry. I will admit, that drying rack sometimes does get piled up and only properly put away in the morning when I’m putzing around, getting miss thing off to school and then again in the evening when working on dinner. But at least they are clean dishes. Just wait till Mazen is a bit older and he’ll be a big help! My now 4 year old daughter loves to help empty the dishwasher! I’ll grab knives and she will empty silverware (and now that she’s tall enough to see inside the drawer she can sort too!) I also let her take out the other dishes, glasses, tupperware, and basically everything that she is able to safely lift and she will place it on the counter for me to put away. I keep a chrome dish drainer in the larger portion of the sink (it’s the side we use less of). That way items are off the counter and pretty much out of sight. Oh please don’t make us click to read more! I love being able to simply read today’s post with minimal clicking. I can’t stand the “click to read more” links… why the switch? I’ve always hand washed, but now I’m in an apartment with a dishwasher and limited counter space, so I’m adjusting. I’ll let things dry on the rack and then put it away so I can chop and prepare the next meal in that space. I just bought that same fabric for kitchen curtains! Except the center of the flowers is gray in mine, but I like your yellow better! I envy all of you who have dishwashers! One day, when I grow up, I will too! Cooking and cleaning up in my tiny kitchen, which has one power outlet, is a bit of a nightmare. My 14 month old has become my silverware sorter. She pulls them out one at a time and hands them to me to put away. No bending! Same here with my 17 month old! I just quickly grab all the knives first. I think it’s all about what works for you. I used to dread emptying out the dishwasher. In my mind it was the beast of a chore that took way too long. But then one night I set my kitchen time to 3 minutes to turn it into a “game” (I use that term VERY loosely) to see i I could empty out the entire dishwasher as fast as possible. And wouldn’t you know…it took me less than 3 minutes! Once I knew it took much less time than I perceived, it made the chore a bit less annoying. Maybe I should use my timer trick for cleaning the bathrooms…. I too dislike the ‘click to read more’. As far as the dishes go- I run the dishwasher, no drying cycle- open when the wash cycle stops. Let them air dry until morning, then put everything away while the hot water is heating for tea in the morning. I hate dishes! With that being said, I have a simplehuman dish rack that is massive and takes up a ton of space but its great for dishes that don’t go in the dish washer. We also put my daughters dishes on a lawn rack so they are nice and separate. The key is unloading the dishwasher right after the dishes are done so you can load it throughout the day and wash the non-dishwasher dishes by hand. What we all need is a little robot that comes and washes your dishes! We don’t have a dishwasher so it’s all hand washed and put in a drying rack. I leave the rack out all the time- it doesn’t bother me sitting on the counter! Our kitchen is also pretty small so it’s easy to stand at the drying rack and put everything away without even taking a step 🙂 I guess that’s a plus to having a small kitchen! The photos at larbs look so nice – her apt is nice with big rooms!? Sort the silverware as it goes in the dishwasher. You have to put it in there anyway, why not put all the forks in one section, spoons in another, etc. THEN…you just pull out all the spoons and drop them in the drawer. It was literally the best thing I ever learned. That was going to be my tip as well! Such a time-saver. I’ve tried that and never thought they got as clean…the spoons all rest together, etc. Doesn’t that happen to anyone else? I don’t mind washing dishes or putting them away or emptying the dishwasher (but I bet there are other chores that I hate with a passion that you don’t mind at all!). Although I agree the drying rack isn’t the most attractive thing, or that it doesn’t annoyingly take up space, I am not overly bothered by it — I’d be far more bothered using a mat and putting things like cups and glasses upside down which would then never fully dry because no air can get to them! At least in a rack the air circulates around everything. 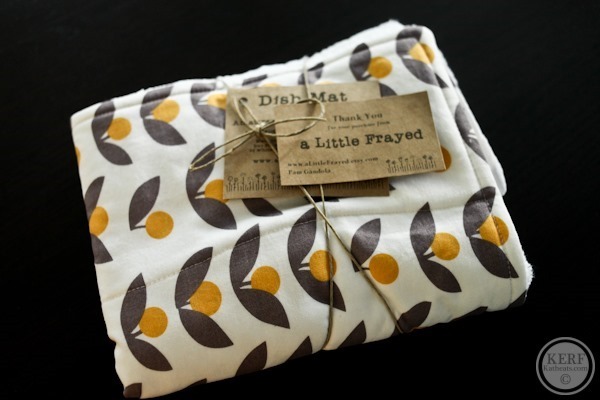 I love that dish drying mat from Etsy! I might have to invest in one! I miss the old katheats! I know that this is a free site for readers and thus you can write whatever you’d like but I have really been missing the real content driven posts that you used to do. You still have them sprinkled in every few weeks but I feel so disappointed when I come here excited to read your thoughts on food and health and instead get photo dumps with no content and posts on unloading a dishwasher. I’m hoping you’re moving back in the old direction that your blog used to take? I miss that style too but I just can’t go back. Mazen takes up so much of my time and attention… and deserves it too. I disagree. I love reading posts like this on things as simple as unloading a dishwasher. I think it’s interesting. Different people like different things, you can’t please everyone! I have to agree with Ali’s suggestion, Kath. This post sort of has me baffled, esp. surprised at how many readers felt that this post on such a frivolous topic – one that I don’t have any time to ponder – was worthy of any thought or discussion. In any event, I respect your decision to do what’s best for you and your family. BTW, I loved that photo gallery you posted yesterday, esp. the snaps of you holding Mazen in the bright sunshine – you’re both looking fab! It’s something we all do daily. .. I’d hardly call it frivolous. I’m genuinely curious about people’s techniques. My 2 cents: I like the current mix! Some posts with more content and some that are lighter. Kath, I think it’s great that you are finding a good balance as a mother. It’s so important! Dish pet peeve: Never in my 5 years of married life have I had a dishwasher!! 2 years of that we lived in a tiny cute California apartment, 2 years in Korea, and 1 year now in Hawaii. Hey, I’ll take beach over a dishwasher. Secrets: I do all my dishes right before bed time. I HATE waking up to a messy kitchen. I wear rubber gloves, up to my elbows! It keeps my hands from getting dried out and I think reaching in to pick up the food laden drain plug is yucky. I also have a cushy kitchen mat to stand on. If I’m going to scrub it out each day, my legs are at least comfy! I like to start with the bottom rack of the dishwasher and then move up to the top rack…it avoids water potentially trapped in a glass or something from spilling onto the clean dishes below. We just grab the silverware from the dishwasher and sort as we go. It’s never bothered me/seemed like a big deal. I bet it takes just as long to sort and then to put away as it does to just grab and sort as you go. I’ve also timed myself and it just takes a few minutes to empty the entire dishwasher it doesn’t really bother me anymore to just do it! One time saver for the bed: we don’t really like/need a sheet on our bed so we just use a comforter and it makes making the bed SO easy! We recently replaced our dishwasher after the one that was in the house when we moved in-probably more than twenty years old-died before Halloween. I was happy about finally the last appliance that wasn’t stainless, but the one thing I miss is the utensil basket in my old dishwasher, which had just enough slots to sort all of the silver by type, and each slot was large enough to hold all of that type of utensil that we might put it. Now we just stuff it in, then pull it out and sort it while we stand in front of the silverware drawer! My husband and I divide the dishwasher emptying tasks, I do the “non-standard” items like the pots, juicer pieces, and travel mug parts. He does the bowls, plates, glasses and silver ware. I also wipe down the counters while he does the bigger pots by hand during the end of the night clean-up. It’s good to know our strengths and divide & conquer! I weirdly LOVE emptying the clean dishes out of the dishwasher…but I WILL NOT put the dirty ones in!! My family knows that if they rotate who handles the loading I will take care of unloading, every time! I guess the thought of touching other peoples old, dried-on food and grime makes me want to…blech. If I ever become a mom someday I suppose I’ll have to get over that, haha! I always have a dish drying rack on my counter. I don’t love to look at it but there’s nowhere it really fits to put it away and I find I’m doing dishes so much there’d be no point in putting it away! For my 17 month old’s sippy’s and snack cups I have a Munchkin bottle drying rack that stays on the counter. Sometimes the stuff never even gets put away we just let it dry and by that time we need it again anyways! I try and keep it neat looking though because I don’t like clutter and mess! Emptying the dishwasher I do it all straight from the dishwasher and I carry the silverware holder over to the drawer and just put it all away in the drawer as I pull it out. I definitely sort my silverware in the drawer, would drive me nuts not to! No dish washer here. I handwash everything. I have always had a dish rack but I don’t love it. I may need to invest in some of those pads you mentioned. I usually let my dishes air dry unless it’s a big cooking day or baking day. 1 – Take off rings and put in old fashion recipe card box on window sill. 2- Spray everything in sink off with HOT water, get scrubby wet and soapy. 4 – Turn on hot water (as hot as I can stand) and rinse off a dish. 5 – Turn off water and put dish in dish strainer, repeat. 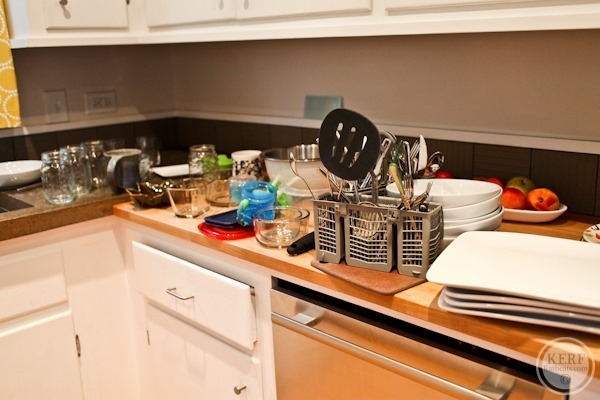 6 – Try to put away dishes nightly. Usually fail and then try to use dishes out of the strainer when making the next meal, instead of having to put them away. Like others, I carry the silverware caddy to the drawer and put the silverware away. I just want to add that cleaning the dishes is the part I don’t enjoy. Unlike other chores like mowing the lawn, the dishes are only done for a few hours before they need doing again. We have a dishwasher but rinse before we put them in the washer and wash all the pots, pans, etc by hand. I’ve been listening to music lately when doing dishes which makes it more enjoyable. I have a double sink. The sink on the left has a drying rack that stays there. It doesn’t bother me because it sits IN the sink and you don’t really see it. As for the dishwasher, I put silverware away straight from the washer but everything else gets sorted on the counter and then put away. It’s most efficient that way. We have 4 kids and I have a small, in-home daycare center so my dishwasher gets run 2x a day! I have to say that I have perfected my technique and can have that sucker unloaded in about 5 minutes, tops. I am guilty for letting dishes sit too long in the sink to hand wash….but unloading the dishwasher has become easier since I started unloading by cupboard. So all the plates and bowls come out first. Then any larger mixing bowls for another cupboard,all the cups and mugs,and so on. Keeps me from opening and closing all our cupboards,or keep them all open while I unload and risk bonking my head! I always do silverware last and also grab by type. I usually grab all the forks first,then all the spoons,then the knives. Into the drawer they go! I swear this is the fastest-it takes me no more than three minutes start to finish! I don’t like dishes in the sink or a dishrack on the counter. The rack is stored under the sink when not in use. We do the items that require handwashing after dinner (or whatever meal), they are dried, put away and the rack is put under the sink. I just want to chime in. I love posts like this. I think they are so fun. I don’t have a dishwasher. Never have. I get my dish cloth soapy and wash the dishes and rinse as I go. I know it wastes water but I keep it running the whole time. I put the dishes on a dish towel on the counter to dry. Now the problem that I am trying to find a solution to is what to do with the dirty dish cloths and towels after finishing the dishes. I use a clean set everyday and only wash them maybe once a week so where do I put the wet ones while waiting for laundry day? I wash by hand all the time too. I use my oven handle to hand wet towels, and my husband put a towel rack on the front of the fridge – which is white, not stainless. THey dry pretty quickly. I like posts like this. I guess I’m weird like that, judging from some of the negative comments about it, but I’m always curious to know how people with such uncluttered houses like yours, keep it that way!! 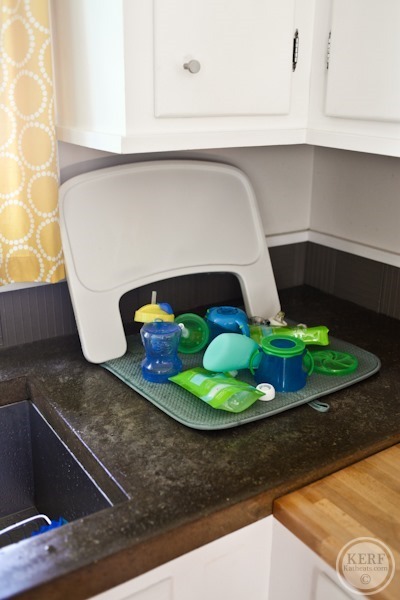 I have an ugly dish rack on my counter, and I’m always looking for ways to declutter my counter, but I feel like if I got an absorbent mat, it would look even more cluttered since it would take me so long to actually put the dishes away! Love this blog. I think. Am having a dumb attack though. Don’t you have to bend down the same amount to remove the dishes from the washer regardless of where you then put them? This post is hilarious. 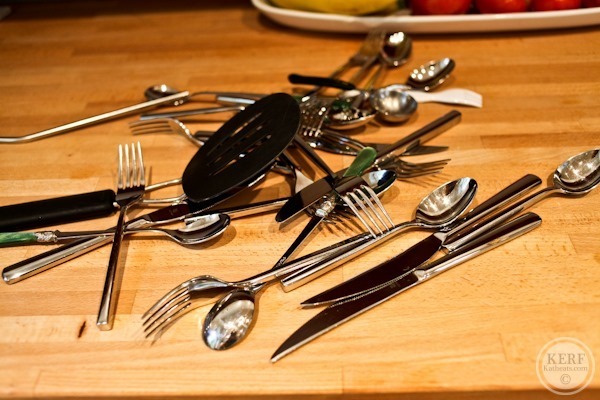 I feel like it would take longer to make silverware piles…I just grab a big handful and sort them out real quick into their correct spots in the drawer (sorting silverware was always my favorite job growing up). I wash all my dishes by hand and set them in the drying rack to dry overnight (I have a double sink with drying rack in one side). I get around having a dish rack on the counter by keeping it in the sink! We have a doublewide sink with just one basin, so the rack goes on the right and we wash the pots & pans on the left (with running water and a plastic scrub brush, & occasionally the salad spinner for a dishpan). Everything gets washed at night and put away while I’m waiting for my tea to boil & steep in the morning. And then I get a tea reward! For emptying the dishwasher, our dishes & glassware are stored just above it, and the silverware drawer is right next to it, so that cuts down on running around the kitchen while putting things away. Silverware goes first, sorted a handful at a time. Next I put away the bottom rack (plates & some bowls) so it’s entirely done, & I have an automatic “halfway done with this task!” mental marker. Next is the top rack, with bowls put away first, glasses second, and mugs and odd bits last. The mugs go in the next cabinet down, so I line them all up on the counter while pulling out & stowing the glassware, and then I just move to the next door and put them all away at once. I’m actually really interested to see how obviously I’m building rewards & benchmarks into my routine. Does anyone else do this? Reading this post and all of the responses has made me realize there actually is a silver lining to having a tiny postage stamp kitchen – I never thought it was that big a deal to unload the dishwasher, so at first I was sort of confused by your even having a technique, etc. But now I realize that it probably isn’t a big deal to me because I don’t have to actually walk away from the dishwasher at all in order to put something away! I either put it straight above, or I turn around and put in the cabinet there, or the one (yes, one!) drawer we have which is right below that cabinet. So thank you for bringing to my attention that there IS something to like about my kitchen! And now when I find myself envious of someone else’s spacious kitchen, I can say to myself, Yes it’s nice but just imagine having to walk back and forth all over it every time you empty the dishwasher! Ha! I just got 2 drying mat (after Christmas sale!) for pots and pans. I have a drying rack which I store under the sink when not in use. I use the rack mostly for cleaning as I cook and to make sure all plastic ware is dry before putting it away. Nothing is grosser then the smell of sour Tupperware! I also must give a great big shout out to my dear hubby who is in charge of loading and unloading the dishwasher. I call him my kitchen elf, as he usually does this after I fall asleep do I wake up to a nice clean kitchen. The deal is I cook and he does the majority of the dishes. If it were reversed we’d have pizza and Kraft Mac and cheese every day! He should get a nice award for all the dishes he does since we eat most our meals at home and I cook every day. BTW, my soap dispenser in the dishwasher doesn’t open either so when we fill it we just don’t latch it shut. Any ideas how to fix it? Hi Julia, my soap dispenser was broken too and I had to call a repairman to have it fixed. I think he just replaced that little door. I’m not sure if this is something your husband could do but I bet if you searched You Tube you might find a way. I don’t have a husband so that wasn’t an option, lol! Thank! I’ll check it out. I hate cutlery and socks. They are both the smallest part of the job and I always leave it until the end. To help with cutlery sorting we seperate our cutlery as we load. Spoons in one sections, forks in the other and knives in between. This has made a huge difference and saves time. Try it out! Oh Kath – your technique for putting away the dishes would make me CRAZY, lol! 🙂 I could never stand to take everything out and put it on the counter first. Way too many steps. I only ever hand wash big pots so I use the dishwasher for everything else. I have a double sink so there is a dish rack on one side instead of taking up any counter space. I lived for many years without a dishwasher so now that I have one, I take full advantage of it! That said, I’m pretty OCD about my dishwasher – I rinse everything before putting it in there because I don’t want smelly, dirty dishes sitting in there…yuck! I’m sure I use way too much water doing that but I can’t help it. When I unload it, I start with the large plates first, then the smaller plates, then bowls, putting everything in the cabinet as I go along. It’s so quick and easy. I take the silverware rack to the silverware drawer and put away forks, then spoons, then knives. Anything else like measuring spoons or larger knives goes in another drawer. The one thing I can’t stand is any plastic items on the top rack that for whatever reason don’t dry all the way and are still wet. I put them on a drying mat or in the dish rack and then put them away when they are dry. When handwashing, I fill the left sink full of hot water and soap, rack goes on the counter, and the right sink is for rinsing. Rubber gloves are a must! I wash a few items, rinse, then turn the water off. Repeat til finished. That is how my mother always did it, and she was sans dishwasher most of her life. Husband dries most of the time. I used to sort the flatware in the dishwasher, but the one we have now has individual slots for each piece. I am the absolute laziest about doing dishes. I just hate them! It doesn’t help that I don’t have a dishwasher, so I have to hand wash everything. Back when I did have a dish washer, I would sort my utensils before putting them in the rack dirty. I always loaded the dishwasher as I used dishes, so it was easy to put all the spoons in one slot and the forks in another slot, etc. Then when it comes time to unload it’s just grab and go. My husband, when he rarely empties the dishwasher or dries the dishes, uses your technique of putting everything on the counter first and then putting the things away—-and this drives me INSANE! 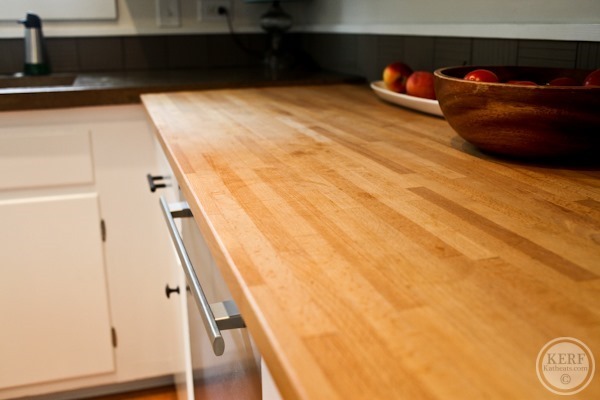 I cannot stand to see all of the clutter on the countertops. I am the complete opposite: I put things away 1 at a time, even if I have to walk all the way across our very big kitchen! Out of sight, out of mind, IMO! As for loading the dishwasher, I can fit 2-3 times as much stuff in there as my hubby, who is the most inefficient loader known to mankind. So what do I do, but go behind him and rearrange everything…. and yes, that drives him crazy! My brain sees so much wasted space when he has it loaded. That mat is so cute, I love the print! We sort the silverware as we load the dishwasher. It’s a little trick I learned years ago that took a while for my husband to jump onboard with. It takes minimal effort to load and is a super quick and efficient way to unload. Our dishwasher has several little compartments for silverware, so each compartment is for a different utensil. You just grab the contents of each compartment and go straight to the drawer…no sorting required! My husband hated my system when we first started dating, but it makes putting away silverware so easy that now he’s fully on board. I like the idea of doing your bending all at once and emptying it out on the counter. One tip I read, oh wait, I just read it’s in the comment just above mine. Ever since I’ve been doing it, it’s a snap! I just use a dishtowel next to the sink to put my hand-washed items and change it every couple of days. I also have to rearrange things when James loads the dishwasher…. and look for the items when he puts them away, but never mind either of those. 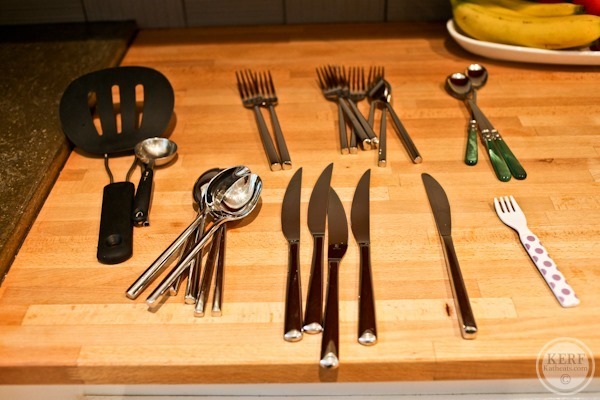 Because putting away the flatware was my job growing up, it doesn’t bother me to put it away. I pull the knives out first to put in the block, then the utensils, then grab the flatware in bunches and sort as it goes into the drawer. James pulls the whole rack out to take to the drawer. My husband does our dishes. But he doesn’t think putting them away is part of “doing the dishes.” So I somehow end up with that. We always have dishes all over our counter. It drives me a little nuts, but not enough to put them away sooner. My mom and dad always make comments about it too, ha. I try to put them away while I’m making dinner. Sometimes that works, sometimes it doesn’t. Oh and I want the dishes washed every day. Well, my husband doesn’t always agree. But hey, I don’t have to do them, so no complaints here. I loathe doing the dishes! love ready everyone’s ideas! It’s a challenge to me to see how fast I can unload the dishwasher. I’ve learned if I load everything in organized, it takes less time –all the spoons in one slot, all kids cups and plates lined up, etc. I can grab and put away items in one quick motion. I also adopted the mentality that if it takes less than 15 minutes just do it. Crazy how much more just gets done and I can get onto other things! I know I am behind on this one, but I am just catching up on old posts. I make everyone sort their silverware before putting it in the dishwasher. My silverware basket thing has 6 sections so there is room for everything to have its own section, then when I am ready to empty its ready to go into the drawer. My husband has learned the rules fairly quickly, but it can be frustrating when guests want to help by putting dirty dishes in the dishwasher and they mix it all up. 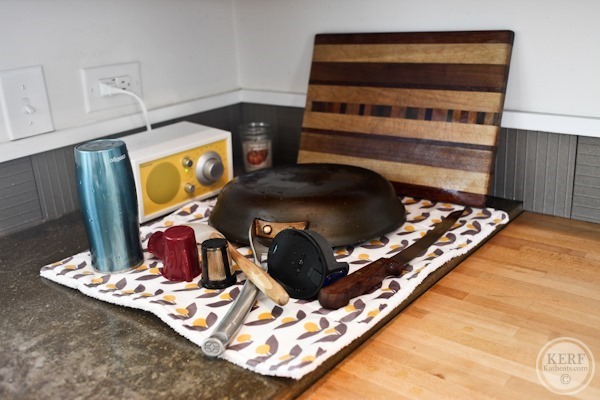 Family member won’t have or use a dish drainer.totally believes that any dishes drying in or near there sink drain is unsanitary…….me……I have and use dish drainer to dry and also use my dish washer. Interesting thoughts. You’d never think there’s so many ways to go about this haha. I know I have tons of dishes all the time from all the meal prepping I do! Great article.